Caol Ila is a deceptive drop, both in pronunciation and in presentation. The Scots will tell you, aggressively, that there is one way to pronounce Caol Ila and that is “Cull Eel-a” blurred into one word. You’ll be lucky if spellcheck doesn’t turn it into Coal Ikea, but stay well away from that and do not be fooled by your non-Gaelic upbringing. It is also deceptive on appearance. The box is black, but in particular the bottle is darkened grey glass, as if the Islay smoke itself was swirling inside staining the bottle like the wind lashes coastal cliffs. But once the dram is poured, the liquid is pale as if pulled straight from a virgin oak barrel. 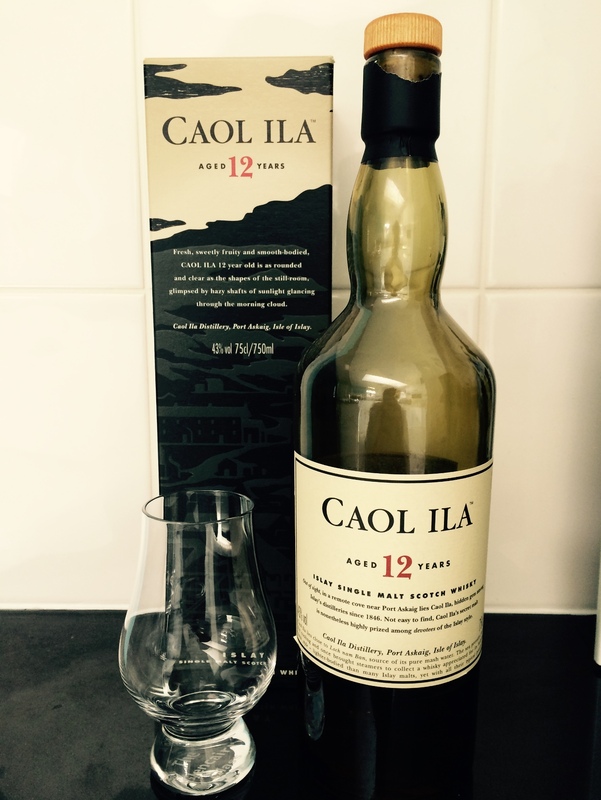 Caol Ila means Sound of Islay but is not one of the best well known of the Islay malts and, despite being the largest Islay distillery, it is not in the Islay triumvirate. I am leaving Bowmore out of the triumvirate if anyone is struggling to narrow it down to the big three. On the nose, there is the smoky peat smell that makes it quintessentially Islay. There are hints of peppermint and the fresh fruit leaf smell coming through but most surprising is how the brine – more subtle than many an island whisky – adds an intensity without being overpowering. This translates onto the palate where, combined with a caramelised sugar sweetness, the peak hit comes back for a second round. Despite the colour and viscosity on appearance, Caol Ila is quite an oily whisky and arrives like a malt older than its twelve years but without the punch of those elders. It is disappointingly only bottled at 43%. The finish is long and the oily quality stays in the mouth for round three of peat hit. But don’t get me wrong, this in not the kind of peat that will clear a room from smell alone. Unlike the infamous (and exceptional) Octomore, you don’t wake up the morning after trying to remember when you smoked a cigar the night before. But it has just enough to be an excellent easy-drinking Islay malt. Perhaps the most endearing element of the Caol Ila 12 is what, I suspect, it contributed to the now deceased blended malt Johnnie Walker Green Label, but that is a story for a future musing. Big Three: Ardbeg, Lagavulin and Laphroaig? I do believe they are the ones Mooresy is referring to! And I would agree! I’ve been to all three – in the same day! Walking from one to the next on a gloriously sunny day. Best pub crawl ever! I have tasted this one at a “tasting” and wasn’t that impressed. But whisky is like pizza: if it’s a bad pizza, it’s still a pizza. Recently I had a special moment. I decided to drink my bottles last zips, since I had many bottles with just one glass left. About two weeks ago it was turn for my 1999 Coal Ila to be emptied. It is a cask strength Coal Ila, bottle by the Dutch “Ultimate”. It is a 10 year old, and so rough!! Fantastic! Smoke, peat, alcohol.. burning your mouth. I find that if had directly after a non-peated dram, this tastes amazing, however, in comparison to other islays, it’s not as impressive. That 1999, however, sounds amazing! Oh, and I totally know what you mean about having a number of not-quite-empty bottles lying around. It’s so hard to finish it off! We were introduced to Caol Ila from a neighbor who was given a bottle and didn’t like it. (He favors Jameson’s 18, posh, eh?). So he gave it to us, woot! The wife loved it. Anyway I remembered it had a bit of a weird taste, so I just ran upstairs & cracked the brand new bottle the wife had laid aside. It does have a strange taste mid-palate & I figure that it must be the oily character you write of. Light machine oil – and it goes well with the green leaf aspect. Unique, I have to say, as Talisker 10 is unique, though I think the latter dram is a better unique. Bottom line, I like Caol Ila, it headreaches past Bowmore for character, IMHO. I completely agree. Talisker>Caol Ila>Bowmore. Although, a free bottle just about trumps anything!